AFAR AND WITHIN: SILK PAINTINGS FROM TWO MILEUS — ART AGENDA, S.E.A. Paintings on silk are some of the most original works of global 20th century modern art, centred around the artists-graduands of the French-established École des Beaux-Arts Indochine (EBAI) who had been encouraged by their academy instructors to engage vernacular subjects and material in their works. The Vietnamese diaspora in Paris – with the quartet of Le Pho, Mai Trung Thu, Vu Cao Dam and Le Thi Luu being the most prominent – were highly attuned to the zeitgeist of their adopted homes, their works referencing (and in dialog) with other artists central to the School of Paris such as Amedeo Modigliani, Raoul Dufy and Marc Chagall. 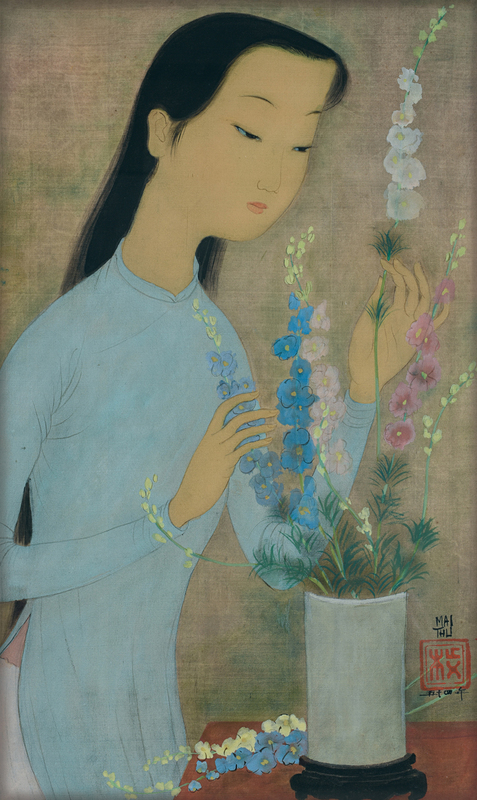 The Vietnamese artists found silk a medium that embodied markedly different qualities to painting with oil on canvas. The restrain of painting on silk led the artists to apply svelte elegant lines; these lines sometimes disappear entirely in the modulated and translucent colours they employed. 20th century paintings in silk as represented by the works of Vu Cao Dam and Mai Trung Thu in this display, signifies a gradual, non-disruptive advancement of art history during the immediate post-WWII years. The artists living in post-war Vietnam however had a significantly different relationship to art history. The educational system, post-1975, became a propagandist arm of the State, with a demand for Social-Realist depictions of Vietnamese life and its cultural values. With the art curricula (even today) focusing predominantly on technique and method, with little insight into the foreign network of historical influence on 20th century Vietnamese masters; the reference points for an art student lying not with teaching expertise or textual resource, but with the Internet and the opportunity of travel. For the young artists presented in ‘Afar and within: Silk paintings of two milieus’, exposure to the world of silk was via the limited collections of the Vietnam Fine Arts Museum in Hanoi; the tutelage of local practitioners in Ho Chi Minh City, such as Bui Tien Tuan; and more critically, via the study of modern and contemporary Japanese silk masters, such as Kitagawa Utamoro (1753-1806) and Nihonga artist Fuyuko Matsui (b. 1974). The preference for not mounting silk on paper (as traditionally found in the work of Mai Trung Thu and Vu Cao Dam), rather experimenting with framing techniques to highlight the transparency of silk (Le Hoang Bich Phuong) or playing with the sculptural abilities of the folding screen (Le Thuy); reflects the conceptual qualities of space increasingly investigated in Vietnamese artistic production today. Where Mai Trung Thu and Vu Cao Dam’s imagery pictures femininity in observation as delicate, sensual and maternal (particularly reflective of the social attitude of the time in which they lived and worked) in stark contrast, Nguyen Thi Chau Giang, Le Thuy and Le Hoang Bich Phuong present portraits of womanhood on silk that are inherently endured and psychologically confrontational, boldly challenging social assumptions of their gender – these characteristics of merging traditional aesthetic with topical reflections of contemporary life being of particular interest to international public museum collections (the most notable giving recognition to Vietnamese art, since the 1990s, being the Queensland Gallery of Modern Art, Australia and the Fukuoka Asian Art Museum, Japan). Interestingly, it is the female artist who dominates experimental expressions in silk in Vietnam today. While art historian Nora Taylor notes in 2009, ‘From the colonial period, which saw artists as artisans and women as homemakers, to the revolutionary period when women and men became equal coworkers, to the present-day pressures of capitalism and the global art market, artists have yet to free themselves of the constraints of their identity within Vietnam’s social system’, what we see in ‘Afar and within: Silk paintings of two milieus’ demonstrates how artists today do succeed in breaking away from such conventions of ‘identity’, heralding an artistic generation (with a higher number of woman artists than ever before) determined to look in new directions with the social subjects of their work. ‘The Glass Box’ is a private VIP program, initiated by The Factory Contemporary Arts Centre. Please click here for more information.